The purposes of the D-6 zone are to permit high-density development of mixed uses in an area bounded generally by New York Avenue, N.W. and M Street, N.W. between 12th and 19th Streets, N.W. 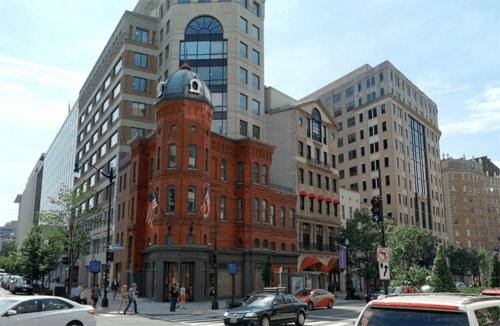 and, in conjunction with sub-area use requirements, to promote the retention of a vital retail corridor on lower Connecticut Avenue, N.W. A building with frontage on a designated primary or secondary street shall meet the design requirements on Subtitle I § 602. The following Downtown Sub-Areas are found within the D-6 zone: Downtown Retail Core, Downtown Arts, Pennsylvania Avenue, Lower Connecticut Avenue Corridor. The D-6 zone is not subject to the Inclusionary Zoning provisions of Subtitle C, Chapter 10; however, a building in the D-6 zone may generate or use credits in accordance with Subtitle I, Chapters 8 and 9, which explains the credit system relating to Transferable Development Rights (“TDR”) or Combined Lot Development (“CLD”) rights. The permitted Floor Area Ratio (“FAR”) and height of a building in the D-6 zone are based on the right-of-way width of the street upon which it fronts, as detailed in the table below. A front setback is not required, except as otherwise required by Subtitle I § 612 in the case of a designated primary street segment. 1 The maximum permitted FAR for a building shall be the density achievable within the height and bulk permitted by the zone and any applicable sub-area regulations: (a) If all of the building’s FAR is devoted to residential use; (b) If all FAR exceeding the non-residential density permitted in Subtitle I § 555.3 is devoted to residential use; or (c) If conditions (a) or (b) are not satisfied through the use of credits provided for by Subtitle I, Chapters 8 and 9 enable. 2 Subject to applicable regulations governing courts, side or rear yards, front setback or build-to lines, easements or historic preservation. 3 Unless modified in in Subtitle I, Chapter 3 or by regulations governing a specific Downtown sub-area. 4 No parking is required in this zone, but parking spaces provided are subject to Subtitle C, Chapter 7.